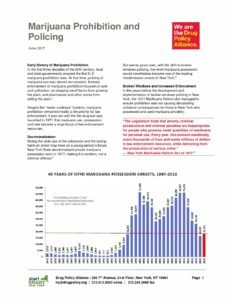 The enforcement of marijuana prohibition in New York State has significantly changed policing. It has been the catalyst for abuses of police power and the deterioration of community trust. It has also been a major drain on already-limited state resources. Start SMART NY is a campaign to end marijuana prohibition and repair the harms to communities convened by the Drug Policy Alliance in partnership with groups dedicated to ending marijuana prohibition.